Is this the maddest Lamborghini Aventador yet? Not many humans would look at the 691bhp, lozenge-shaped Lamborghini Aventador and conclude it needed a bit more visual bite. 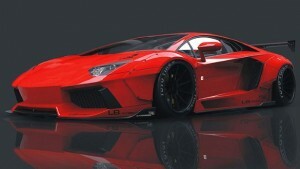 Renderings fresh from his computer show a £260, 000 blood-red Aventador that he’ll cut, stretch, bash and rivet within an inch of its life, before presenting to the tuning world at the SEMA later this year.